CHICAGO – Flor Crisostomo is a well-known immigrant rights activist here who spent nearly two years in sanctuary at the Adalberto United Methodist Church on the city’s northwest side. In a prepared statement released Oct. 19, Crisostomo announced she has left the church in order to begin the next phase in her struggle for immigration reform and the rights of indigenous communities. “I came to the decision to leave sanctuary in order to begin what would be the next phase of my activism and more effectively serve this struggle in the days, months, and years ahead,” she said. According to Susana Sandoval, a spokesperson for the immigrant rights leader, Crisostomo is not taking any interviews at this time and her current whereabouts are unknown. It’s unclear if Crisostomo plans to stay in Chicago or the country. “No one knows where she is,” said Sandoval on the phone. “She will let people know what her next steps will be on her Web site very soon,” she said. Jacobita Alonso a lay leader with the Adalberto church has been a close friend and companion to Crisostomo for several years. Alonso said she was surprised to learn that Crisostomo had suddenly decided to leave the church. The two have not spoken since Crisostomo departed, said Alonso. “All I can say is that I wish her luck on her new journey,” said Alonso. “I know where ever she is she will continue to fight for justice and the rights of undocumented workers,” she said. 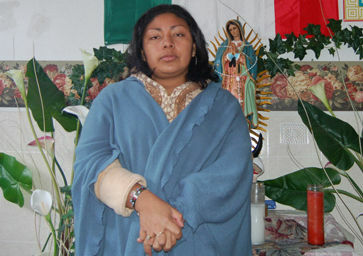 Crisostomo, a mother of three, is originally from Oaxaca, Mexico. She crossed the Arizona desert in June 2000 to find work in the U.S. so she could support her family and send money back home. During an immigration raid in 2006, Crisostomo was arrested at a wooden pallet-making company in Chicago. She was among 1,200 immigrants detained nationwide in federal raids at the time, which were widely seen as a Bush administration move to intimidate the immigrant rights movement. After two years of exhaustive legal appeals, Homeland Security ordered Crisostomo to return to Mexico by January of 2008. In defiance of the deportation order she decided to take sanctuary at her church in an act of civil disobedience. Crisostomo followed her good friend and immigrant rights leader Elvira Arellano who lived in the same church for a year resisting deportation in order to stay in the country with her U.S.-born son. 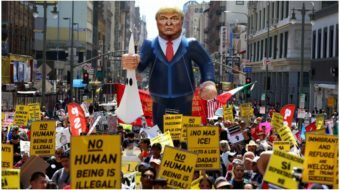 Arellano made national headlines and became the face of the immigrant rights movement that saw millions march nationwide in 2006 and 07. Arellano was eventually arrested in California during a planned speaking tour of the country in 2007. In the recent letter Crisostomo thanked all her supporters including the local immigrant rights group Centro Sin Fronteras, which she said helped her grow and develop politically. She also thanked members of the church that gave her spiritual support since the day she was apprehended. She recognized Jacobita Alonso as a guide, friend and companion. Crisostomo also thanked the diverse communities of faith that supported her over the last two years including the Puerto Rican community of Humboldt Park, which she says helped protect her and vigilantly watched over her security. Speaking to this reporter in early 2008, when she first took sanctuary, Crisostomo said she believed the fight to end the abusive system of exploiting undocumented labor in the U.S. was a just cause. She knew back then that by resisting her deportation order there would be little chance that she will ever achieve legal status to remain in the U.S.
“I may face time in prison. But when I do return to my children, I will not return, as so many have, empty-handed and unable to provide for them. I will be able to give them the only thing I can pass on to them: My dignity,” she said.